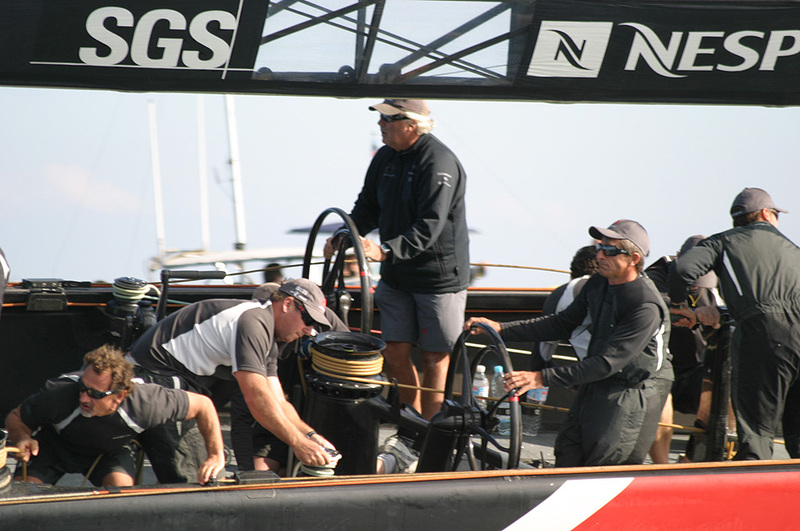 Now on his fifth America's Cup campaign, Alinghi strategist Murray Jones is the man who decides where the wind is " Onboard, I'm working on the strategy the whole time with the tactician, talking about the wind primarily, what we think the wind's doing, whether we think there's better breeze on one side, whether to go left or right, which side of the competitor we want to be on. 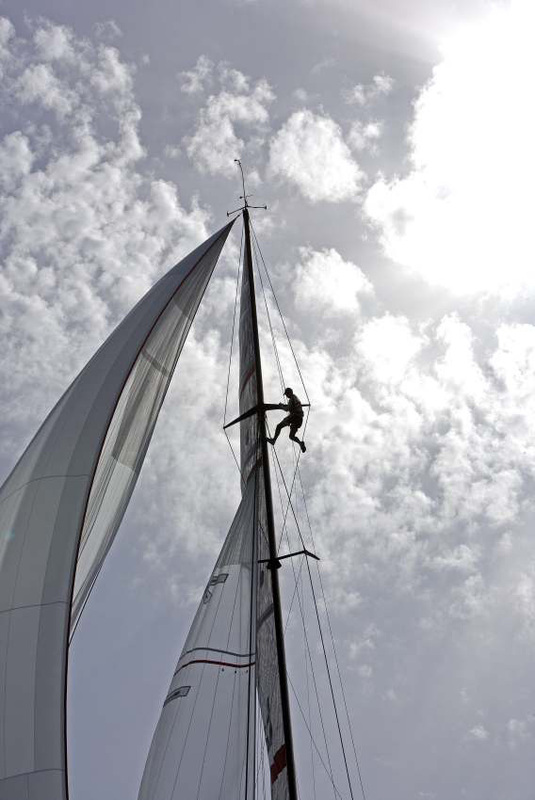 I also trim the mainsail traveller and in light breezes I'm up the mast looking for wind. " 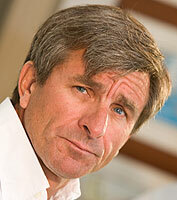 BYM talked to Murray after he'd helmed SUI100 to 5 race wins out of 6, in the CNEV 2nd annual regatta. 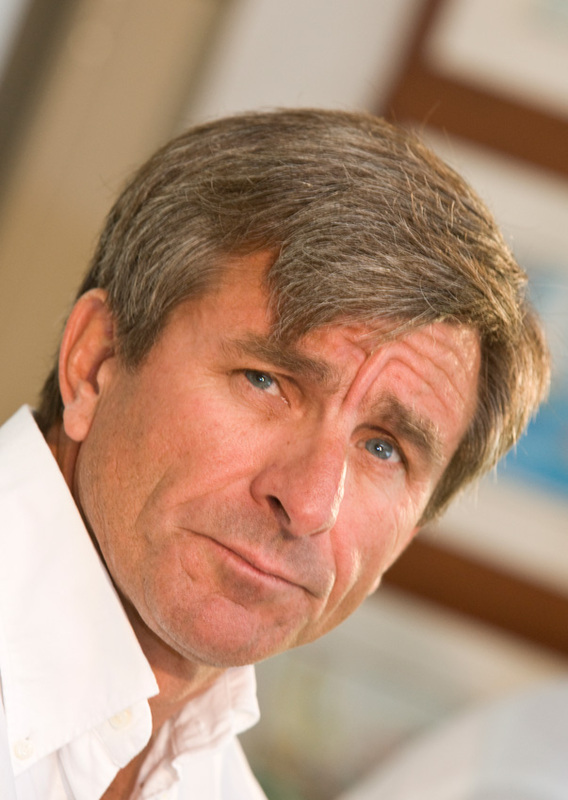 You’ve waited a long time to helm an America’s Cup yacht in a race, how did it feel? It was good fun. It was great, I really enjoyed it. What happened in race 1? TeamOrigin did well in this regatta, considering they had Desafio’s old boat. They did, really well; I was impressed, because it’s not easy at all to come out and borrow someone’s boat and put together a team of guys that haven’t worked together closely before and come out and win the first race. Why do you think the Desafio crew weren’t as good as they should have been? They just didn’t seem to get their act together this weekend. I’m not sure why, you’ll have to ask them. You’ve been sailing catamarans all year, the D35 and Extreme 40. 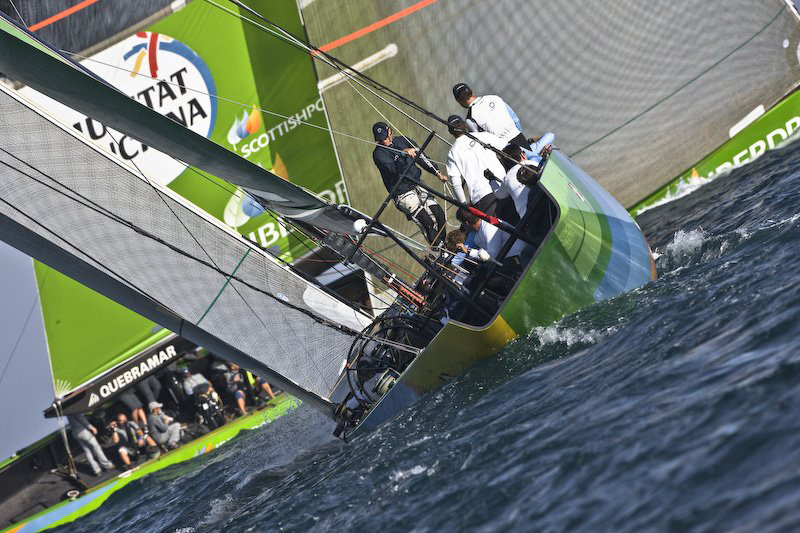 How difficult was it to get back in the swing with the monohull? We practised for two days before this regatta and I felt so strange to be sailing this boat after the catamarans; it was a weird sensation. It felt like they never accelerate, so it was difficult to adjust to that lack of speed and acceleration, especially downwind, but then I’ve done so much, so many years of sailing these boats that it just came back. They're just different. I really did enjoy sailing the multihulls; it was a new experience for me and I really, really enjoyed it. Hadn’t you done multihull sailing on the D35s before? Not before this year, a year ago was the first time I’d ever sailed a multihull. It was a new experience for me. 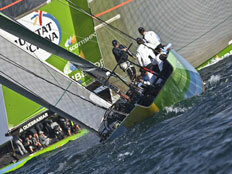 As I said, the catamarans accelerate so much more quickly, so staying in the breeze and not getting slow is important. On the heavier boats, when you have got a bit of breeze you don’t want to sail too low and go too fast, because you’re just giving away height, so it’s a bit like the opposite. 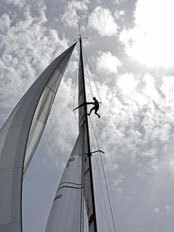 You look to gain height on the big heavy boat and you look for speed on the catamaran. You�ve been sailing Le Black as well, which is a sort of hybrid. How does that compare to a trimaran, or a catamaran? I only did two days on Foncia, that�s the total of my trimaran experience, but you know Le Black was built for sailing in Switzerland, on the lake, mostly in very light winds, so it�s got a lot of sail area and as it�s orientated towards light winds it�s quite an overpowered boat. It wasn�t designed for the sea, so sailing here in Valencia was really good fun. Every day we went out was challenging. Yeah, (laughs) very hairy. It was great though, I really enjoyed every single day I went out on that boat. It is so fast; you�d go out in 10 knots of breeze and be reaching with a gennaker at 22 knots. It�s incredible for a boat of that size. Would you like there to be a multihull match, or not? Well, disregarding what’s right and wrong for people and their jobs and for the America’s Cup, I would personally love to do the race in a multihull. It would be so much fun and such a challenge. Our boat hasn’t even completed building, but to go through the whole thing and then learn how to sail it and then race it would really be a challenge. 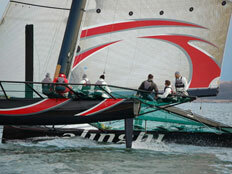 If Alinghi wins the court case, do you think it will be finished? What would be ideal to me would be to have a conventional multi-challenger America’s Cup and for those two multis to go against each other in a sort of exhibition match. 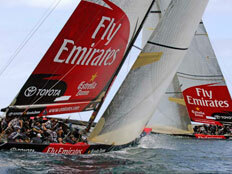 It would certainly be a spectacular race that the sailing world would love to see. You’ve been in a lot of different positions on boats; I’m most used to seeing you up a mast. Which position do you like best? They are all different. I really enjoyed helming on SUI100 this week, I haven’t helmed on one of these boats for quite a few years, so I really enjoyed that, but I enjoy strategy and tactics, which is really my job up the mast. Tell us about your job up the mast. Well it’s really just an extension of being a tactician that you are up there, trying to decide on where you want to be on the course, according to the best breeze or relative to the other boat. If a young sailor wanted to get into that, what should they start doing? The advantage I had is that I’ve done a lot of time as a tactician. Then you know exactly what you’re looking for and what’s important at what time; what’s the priority. So, you can give the right information to the tactician. So, do some time as a tactician and then you can go on to being up the mast and learning how to calibrate the waves. 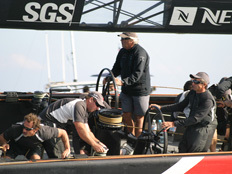 This weekend, Alinghi was without its usual helmsman and some regular crew, but did as well as usual. Does that tell us that the boat is more important than the people? It depends how far you go back, because it’s the people that create the final boat and they optimise the boat and know the boat inside out. 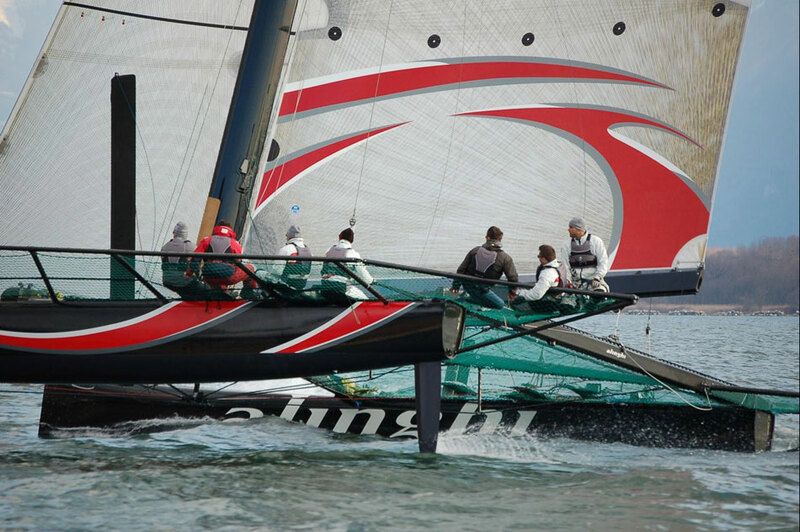 One of the strengths of Alinghi is that we have a lot of depth and multi-talents in the team and they are very good at working together and helping each other with the jobs on the boat. Is that because someone got the right team together, or because you’ve worked together so long? I think we did put together good people to start with and then we developed a culture of working together to achieve the goal, like a family. You’ve entered the Louis Vuitton Pacific Series, how do you feel about that? Well, we’re going to go down there and compete; we decided we’d do that. I think we’ll be taking a low key approach, putting a team together and viewing it as a fun thing to do. (Laughs) Well, I don’t think you want to take it too seriously, or you might end up frustrated. Oh there will be, the press there is always like that. I hope most of the people watching will have got over that, but I don’t know really, I’m not sure. Thanks for the chat Murray and congratulations on winning, this weekend.